Green Valley Floral is so confident in the California cut flower market that it has doubled down on two innovative expansion efforts. The firm has formalized its rose propagation program and has broadened its brokered product offerings – two moves that demonstrate strong demand for the bounty of California Grown Flowers. A rose propagation program that Green Valley started two years ago as a trial has become official, says Janet Louie, sales manager and owner. In fact, Green Valley Floral has doubled the space dedicated to propagation and can now grow enough plants replace the 400,000 square feet of rose plants it grows as the plants meet their lifespan (roses need replacing every five to seven years). In addition to being able to replace plants, the propagation venture allows Green Valley Floral to expand into new rose varieties. Louie says they are transitioning from hybrid tea roses to garden-style single stem and spray versions to meet demand. “We specialize in event work and garden-style roses are wildly popular as far as color, shape and scent,” Louie explains. Janet and Curtis Louie of Green Valley Floral. 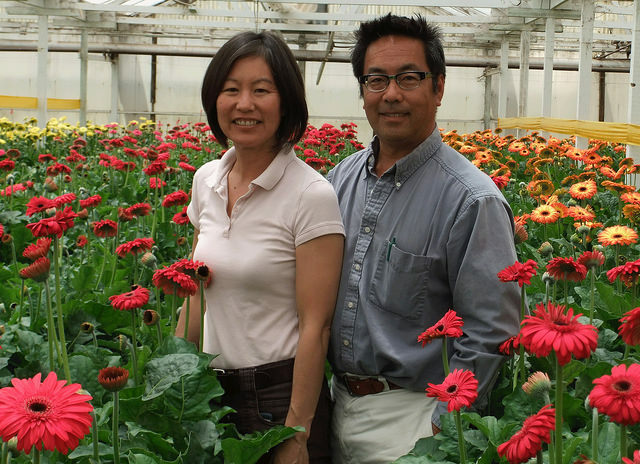 Janet Louie serves as a Commissioner for the California Cut Flower Commission in District 2. Green Valley is a Certified American Grown Flower Farm. On a second expansion front, Green Valley Floral – growers of hydroponic roses, gerberas and lilies – is also broadening the flower and foliage varieties it offers customers by increasing the products it purchases from local farmers. 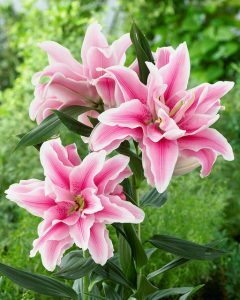 Beautiful double lilies grown in California by Green Valley Floral. Louie estimates she’s purchasing product from as many as 20 nearby small farms, allowing Green Valley Floral to sell California grown delphinium, gardenias, stephanotis, dahlias, dusty miller, lavender, eucalyptus, geranium leaves and ming fern, to name just a few. On any given day, Louie can offer customers 30 to 50 additional flower and foliage products, helping surrounding flower farmers along the way. She says uncovering and bringing additional original products to market is exciting and helps meet her customers’ appetite for sustainable American Grown Flowers that are grown within a few miles of her farm. The bottom line – Louie’s optimistic about flower farming and customer demand for locally sourced flowers. “If you’re going to grow the best flowers on Earth, this is the place to be. Sure, there are changes in the ag community in terms of labor and energy for example, but the demand remains. I can feel it. Customers call us more often than I call them,” Louie says. Best of luck in this new adventure.